Made by the masters of the otome genre, Idea Factory and Design Factory, Code: Realize ~Wintertide Miracles~ continues the adventures of the poison-skinned maiden Cardia and a selection of famous (and famously handsome) figures from Western literature as they face new challenges, new friends and foes, and new opportunities for love. Experience the magic and chaos of two-on-one dates and play with dynamics (and hearts) by bringing multiple members of Lupin’s gang on a wide variety of romantic romps. Learn more about the dashing detective Herlock Sholmés and the mysterious Finis in the continuing sagas involving the newest men in the Code Realize universe, and join Cantarella, the mysterious young lady Cardia met during one of her many adventures, as she gets caught up in the chaos that always seems to surround Lupin and his gang. Those wishing to pick up a physical copy can do so by ordering either a standard or limited edition. The limited edition release contains six 3” acrylic figures (one for each character in a Chibi style), eight 4×6” oversized character cards, the game itself, and a collectible case. Ordering either edition of the game will grant you a free month of Crunchyroll Premium too. 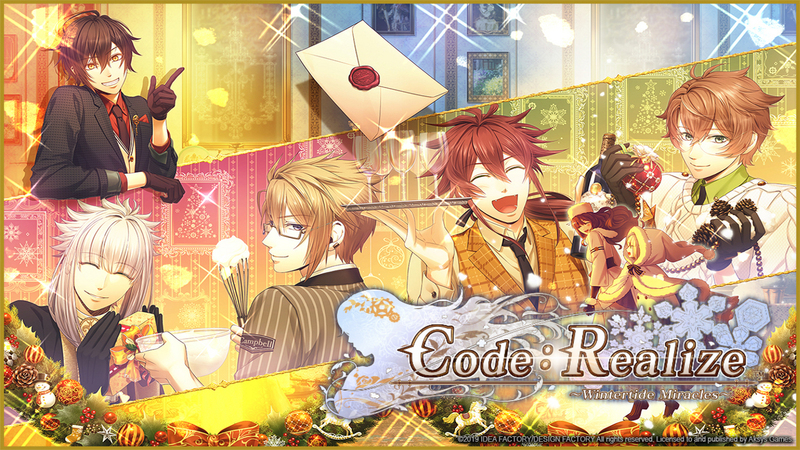 If you’d like to learn more about the first two games, consider having a look at our review of Code: Realize ~Bouquet of Rainbows~ which covers both. Additionally, take a stroll to Wintertide Miracles’ official website to snag some free digital valentines featuring characters from the series.